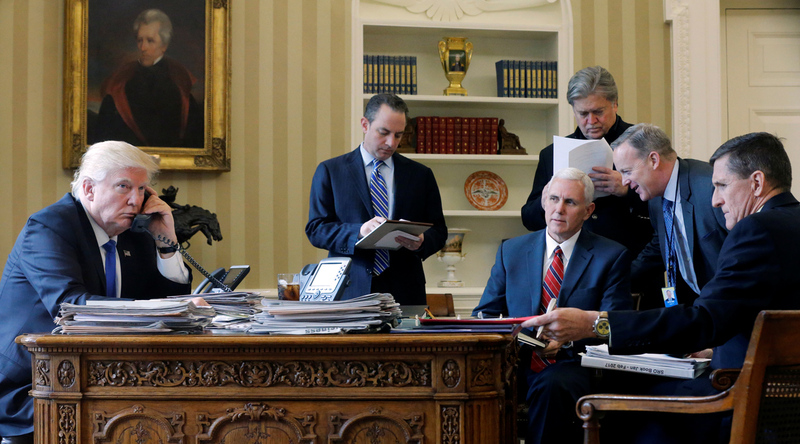 U.S. President Donald Trump, joined by Chief of Staff Reince Priebus, Vice President Mike Pence, senior advisor Steve Bannon, Communications Director Sean Spicer and National Security Advisor Michael Flynn, speaks by phone with Russia's President Vladimir Putin in the Oval Office at the White House in Washington, U.S., Jan. 28, 2017. Now that Donald Trump is in the White House, Russians are discussing the expected détente with the U.S., and they're speculating on which issues and under what conditions Moscow and Washington might find common ground. RBTH and various international affairs experts discussed the possible issues and how they might be solved. The Kremlin and the Trump administration are aware of the common threat of radical Islamism in the Middle East, primarily from the Islamic State militants, and the need to unite in order to stop this scourge. Experts believe such awareness will bring Moscow and Washington together in opposition to the extremists in Syria. Yuri Rogulev, director of the U.S. Studies Foundation at Moscow State University said the basis for this cooperation has already been established. Russian and American specialists in Syria are already working to reconcile the two sides. Communication channels have been established and the exchange of information between the two militaries has begun. Dmitri Suslov, a political analyst at the Higher School of Economics, said Trump's new approach to the Syrian crisis will foster cooperation between Moscow and Washington. Barack Obama saw Syrian leader Bashar Assad as the main problem in the country's crisis, while Moscow always spoke against Assad's resignation. These political differences made a joint fight against the Islamists impossible. Now, the Trump administration will most likely not insist on Assad's resignation as a preliminary condition for a political solution in Syria, said Suslov. This will help "Russia and the U.S. establish practical military cooperation and have a more common position within the framework of Syria's political regulation." Alexei Fenenko, an expert at the RAS Institute of World Security, said that although Trump will have a different approach to the Syrian crisis than Obama, he will still "try to impose on Russia a Syrian government without Assad." This is unacceptable for Moscow because it will "devalue Russia's entire operation" in Syria. The Trump administration will freeze the expansion of America and NATO military infrastructure in Eastern Europe, including in Poland and the Baltic countries, and will try to avoid conflict with Russia, said Suslov. He does not exclude the possibility that Washington will have to "straighten out" its Eastern European allies when they act provocatively towards Moscow. In turn, Russia in the future will have to avoid violating NATO's air space and stop flights with transponders turned off, as well as other provocative actions. "The situation of European security will not be solved, but it will be de-escalated, which Trump can present as his foreign policy victory," said Suslov. Under Trump's presidency Russia and the U.S. might find a way to solve the Ukrainian crisis. Trump sees Ukraine as a problem and does not feel any political responsibility for the events of 2014 that led to the overthrow of the government in Kiev, said Suslov. "The Trump administration is making it clear that it has the political will to put pressure on Kiev to implement its part of the Minsk Peace Agreements," said Suslov. This will suit Moscow because the Kremlin regularly chides Kiev for its unwillingness to implement the Minsk Agreements, the political part of which still has not been approved by the Ukrainian Parliament. The decision on Ukraine, however, will unlikely come soon. Director of the Center for Political Affairs, Alexei Chesnakov said the new U.S. administration is only forming its foreign policy team and it needs time to understand the situation. The Trump administration still does not have a foreign policy doctrine. Also, Moscow and Washington need to have a common vision of Ukraine's future in order to solve the country's crisis. Russia supports the idea of Ukraine's federalization, preferring to see it as a state in which the rights of the regions would be clearly formulated and protected. The U.S. supports the current Kiev government, which even though it speaks about the need to decentralize the country, nevertheless defends the principle of political centralization. The U.S. and Russia will try to reach an agreement on nuclear weapons control, experts believe. Fenenko said this is one of the most important issues on the bilateral agenda. The U.S., however, considers this issue much more important than Russia does, said Vasily Kashin, a researcher at the HSE's Center of Comprehensive European and International Studies. Washington is faced with the challenge of modernizing its entire nuclear triad, which has practically not been renovated since the end of the Cold War. The cost of this expensive project is estimated at hundreds of billions of dollars. Also, with China's increasing military prowess, the U.S. wants to strengthen its military presence in the Pacific Ocean, which is also very costly. To realize both projects, Trump will have to reduce the number of U.S. military bases in other regions of the world, as well as try to agree with Russia on the reduction of nuclear weapons, said Kashin. This will make the modernization of America's nuclear potential less expensive. The reduction of nuclear weapons, however, is not in Moscow's interests at the moment because during the last several years Russia has been modernizing its nuclear weapons. "A deal on nuclear arms control is something that Russia doesn't need, while the U.S. needs it very much," said Kashin. "It means that they (…) must give us a lot in return." In exchange for Russia reducing its nuclear arsenal, however, Trump has only offered to mitigate or remove economic sanctions on Moscow as a result of the Ukrainian crisis. Russian experts believe this is clearly a disproportionate proposal. Rogulev notes that although Trump is showing his "general disposition" to improve economic relations with Russia and cancel the sanctions, we should not expect their cancelation anytime soon. Trump will use this subject in his future talks with Russia, trying to obtain something from Moscow in return. There is also the opinion that Washington is basically not ready to lift sanctions. "Lifting sanctions for the U.S. means admitting defeat, and it will look like an American retreat," postulated Fenenko.